Jewellery production, like most non-essential work, came to a virtual halt during the First World War. Jewellery making was revitalized in the 1920s, however, and while many of the pieces created between the wars seem banal to today’s taste, the work during those 20 years clearly forecasted many present-day trends. Several important new materials and techniques appeared in the roaring ’20s that simultaneously catered to and shaped the demands of the time. One development was in stone-cutting. The diamond saw was invented around 1910, and cutters began experimenting to develop proportions that would yield maximum beauty while maintaining the highest possible weight retention. Henry Morse, a Bostonian cutter, developed excellent proportions through trial and error, and Marcel Tolkowsky arrived at similar conclusions, mathematically. In 1919, Tolkowsky published Diamond Design, which outlines his computations for the “ideal cut” – a stone with the perfect balance of dispersion, brilliance and a minimum leakage of light through the back facets. Another important development was the introduction of white gold. David Belais, a New York jeweller, spent years experimenting with alloys. In 1917, his white gold alloy became a commercial success, partly due to the wartime economy, which rendered platinum too costly. 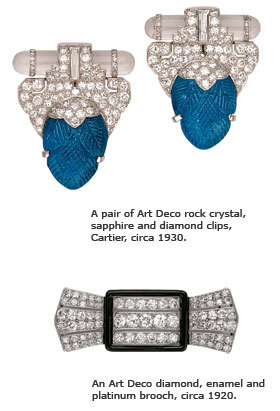 Synthetic rubies and sapphires grew popular and were featured prominently throughout the 1920s and 1930s. They were often combined in pieces with diamonds. Synthetic spinel was introduced commercially in the mid-1920s, but synthetic emerald was not produced commercially until about 1940. Reaction to the rigours and bloodshed of the First World War left many people, especially the nouveau riche, eager for luxury and conspicuous display. Emphasis, early in the period, was therefore placed upon the intrinsic value of the materials (diamonds and platinum) and on big stones. Design was a mere function, a means of emphasizing expensive stones. Platinum was doubly valuable in the jewellery of conspicuous lavishness; it was expensive, but its strength furnished the development of open-backed settings, which resulted in increased brilliance for the stones. Never before had design stressed the stone over the setting. The romantic curves of Art Nouveau gave way to geometric motifs and nonfigurative styles. 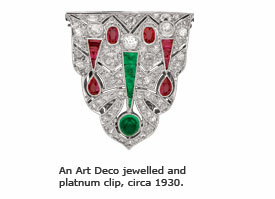 The early 1920s Art Deco jewellers produced severely geometric pieces that were usually Hat or in bas-relief. Squares, oblongs and circles were popular. The spaces in cutout backgrounds were an integral part of some designs and by the early 1930s, the geometric shapes became considerably more elaborate and were often three-dimensional, with powerful, heavy effects. Jewellers began to apply stylization to traditional composition, creating a more modern look. Some of the great commercial houses looked to the past for inspiration; an exhibition of chinoiserie was influential, as was the highly publicized discovery of the Tutankhamen tomb jewels in 1922. Many high-fashion jewellers rendered work on Oriental and Egyptian themes. Others executed forms previously reserved for children, such as charm bracelets and dog brooches. By the end of the period, a number of successful designers moved back to the romantic floral themes of the late Victorian era. The materials of jewellery were lavish. The Europeans, particularly, favoured platinum over gold. Later, combinations of red and yellow gold appeared in brooches, and rubies set off the highly burnished or matte-finished metal. White gold was improved in the late 1920s and was increasingly accepted. Dress clips with platinum on top and white gold at the back were common. As the 1930s closed, white gold had found popular use in the settings and designs of many diamond pieces. The nouveau riche wanted diamonds in profusion; the general use of electric lights made diamonds suitable for evening wear, instead of being reserved for the daytime, as in Victorian times. The step-cut was introduced for diamonds in the mid-1920s, and step-cut colored stones, especially emeralds, became quite fashionable. 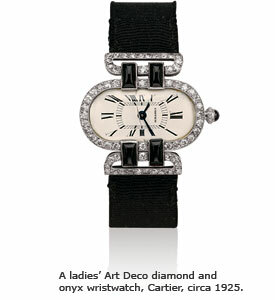 Mid-period, platinum necklaces and bracelets and pave-set diamonds were popular. The materials used in Art Deco pieces were chosen less because of their lavishness than to express certain aesthetic principles. Gold, onyx and steel, with smooth, polished surfaces, set off compositions based on the play of geometric forms. Lacquer, especially black, often marked surface patterns. Designers mingled precious stones, coral, amethyst and even synthetic stones freely. The shapes, sizes and colors all served the demands of the overall composition. Many pieces had rows of calibre-cut synthetic sapphires, perhaps following the inspiration of 19th century mosaic jewellery. Throughout the period, inventiveness was matched by sophistication of workmanship. Platinum made possible new, carefully constructed, open-backed settings and also the very delicate, studied latticework so popular in contemporary Europe. Diamonds were generally pav√© or set in millegrain bezel settings. Squares and rectangles were channel-set. Emerald-cut stones were mounted in plain bezel settings or in millegrain. The best of Art Deco, with its emphasis on precision, demanded great technical skill; some jewellers cut stones to fit exactly into the spaces of cutout patterns. Most of the outstanding jewellery artists of the period signed their pieces; the imitators remained anonymous. There was, however, considerable collaboration between artists, craftsmen and the more artistic industrial firms – partly in response to the ideal of establishing unity among art forms and partly because many people began to realize that joint efforts by artists and commercial enterprise could, and would, profit both sides.